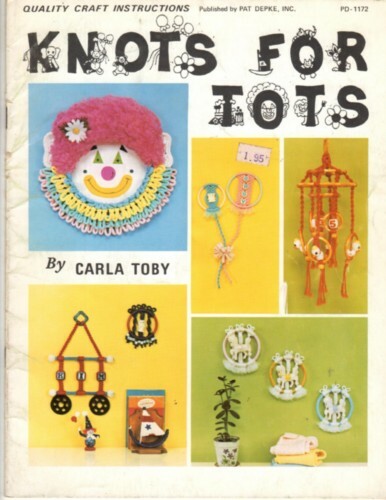 Knots for Tots macrame craft booklet. Carla Toby. Lester Lion, Circus Wagon, Bead Clown, Bead Bunnies, Ernie Elephant, Rocky the Horse, Baby Balloons, Come Sail Away, Clarence Clown, Ciccy Cat, Peek A Boo Planter, The Center Ring, Bead Lion, Loves Me Loves Me Knot, Under the Big Top Mobile, Double Diaper Shelvers, Diamond Dazzler, Mobile. This vintage booklet appears to be in new condition. 28 pages.